Recently I have been pondering the magic of Art and it’s ancient mystical roots. 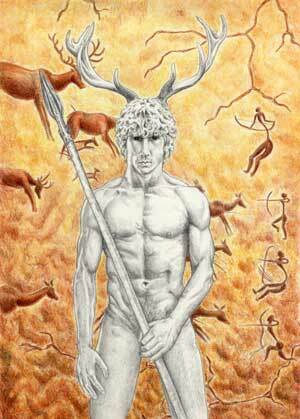 I have recently finished a piece of work called “Cernunnos” that for me speaks of the origins of the pagan Horned God and then, a couple of weeks ago, I watched a curious film called “The Cave of Dreams” made in a recently discovered cave in France where cave paintings have been found, these paintings are believed to be the oldest found so far at around 35,000 years old. I have been driven for a long time by the need to understand what Art is at it’s source and I have long wondered if it still can have the same mysticism and power in a culture that is swamped by banal and fatuous images. Almost every culture has in some way or another over the millennia created animal-headed men that have come to represent Gods, they are very familiar to all whether you be Pagan, Christian or any other religion, and they seem to me to be both a natural and magical way to interact with those forces of nature. They are powerful images that conjure a primal response within us and for me that is the whole point of art, to illicit an emotional response. Even within modern Paganism today many find ourselves drawn to this primal image and connection. In some of the earliest images it is hard to see whether it is a man wearing an animal mask or an animal behaving like a man, the boundary is blurred and I feel that was the point. In order to catch your pray you must first understand it, maybe even become it. So are the beautiful cave paintings art or magic or both? Were the shamans of the tribes, as walkers between this world and the world of spirit, the ones who painted these images, or was every hunter a shaman/artist? Did each hunter believe that to capture the animal in the flesh he must first capture it’s spirit? In the dark recesses of the ancient caves by flickering fire light and with the most basic of ingredients gleaned from the earth, did they sing, dance and drum to the spirits of the animals before the hunt? Did they bind the animals and hold their spirits to give any advantage to the hunters against the enormity of mammoth, lion or rhino. Maybe the shaman stayed in the cave until the hunt was done, holding that energy for the tribe doing battle with magical spear and arrow? Then there are the many small sculptures of naked women with large breasts often called the “Venus” of where ever they were found, older still than the cave paintings in many cases, but one was found as a painting in the French cave with animals woven into the design to look like parts of her body. Did they call to a spirit of creation to aid them in the hunt also? All of these dreams and notions keep me searching for ways to express the ineffable through art, inspired by the magic of the ancestors.